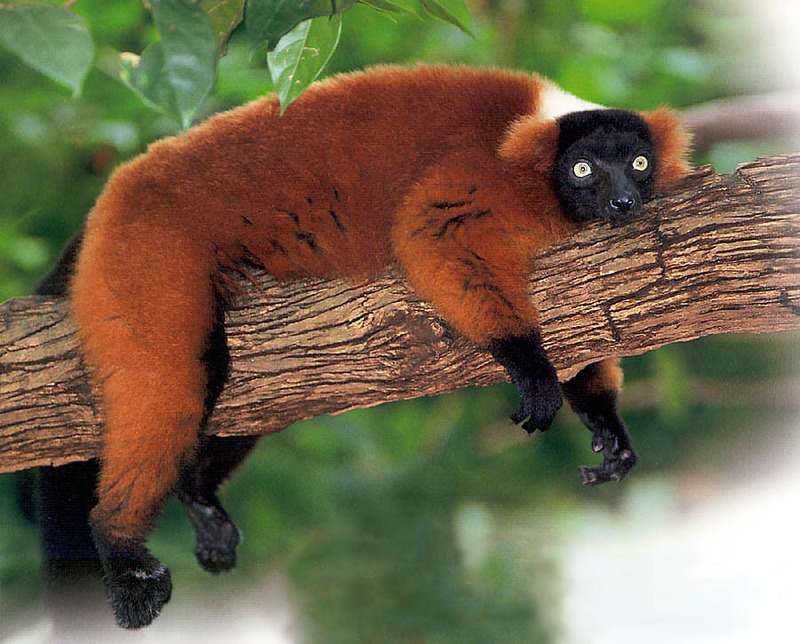 Today I want to write about a cool primate that I found whilst doing some animal research, the red ruffed lemur. These cute primates grow up to 53 cm long and have a tail that is 60 cm long, making them one of the largest species of lemur. They live in small groups of up to 30 animals and spend a lot of their time grooming each other, using their special teeth and claws to comb each other’s furry coats. Red ruffed lemurs prefer to eat fruit, nectar and pollen, but will also eat leaves and seeds when there isn’t much food around. They have very unusual breeding habits and are the only primate to have litters of babies, with up to 6 babies born at a time. The mum makes a nest out of sticks, leaves, vines and fur high up in the forest canopy. The babies are born with their eyes open, but are unable to move around and rely on their mum to carry them around for the first few weeks. Many young ones die from falling out of trees. Red ruffed lemurs are found in a small area of Madagascar and are considered one of the most endangered species of lemur in the world, due to habitat loss and poaching for the pet trade. Are there any other interesting facts that you would like to share about red ruffed lemurs? This was very interesting! I love the picture!